The Desleigh Forster-trained Chapter And Verse has won the $1M Magic Millions QTIS Open. 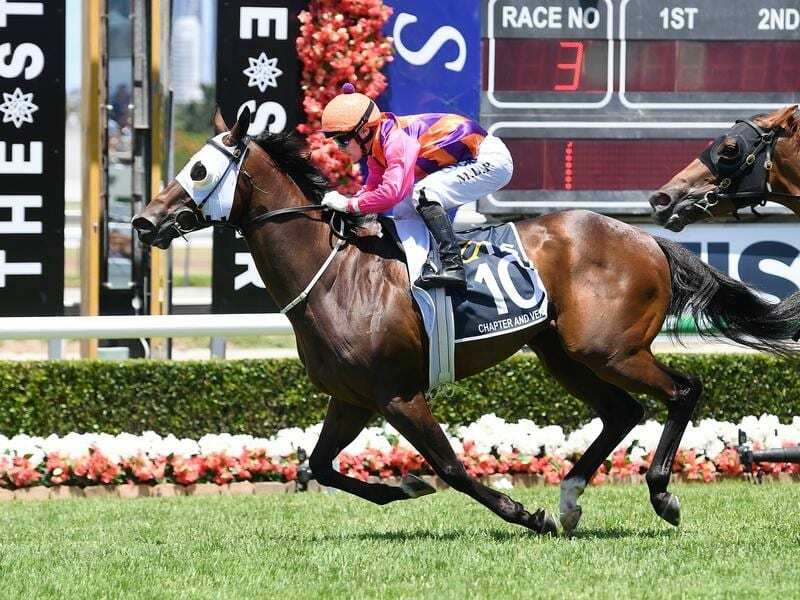 Talented sprinter Chapter And Verse emerged as a Stradbroke Handicap contender after winning the Magic Millions QTIS Open at the Gold Coast. Jockey Mark Du Plessis gave trainer Desleigh Forster the green light to aim the four-year-old at feature races in Brisbane during this year’s winter carnival. “He could be a Stradbroke horse because he’s only going to get better with age,” Du Plessis said. No one celebrates a win like Forster and she led the raucous celebrations as Chapter And Verse, the $5.50 equal favourite in Saturday’s $1 million race, passed the post three-quarters of a length in front of Tokoriki Lad ($7.50). “Winning this race means so much to me because I haven’t had the best of luck in big races at the Gold Coast,” Forster said. Du Plessis followed Forster’s instructions to the letter, stalking the speed before bringing the gelding with a well-timed finish in the straight. “I said to Mark not to be worried about being three-deep because I knew he was the best horse in the race,” Forster said. “All I wanted him to do was be patient and wait until the furlong because when this horse hits the front he tends to switch off. One of the first to greet Forster after the race was leading Queensland thoroughbred breeder Basil Nolan who offered Chapter And Verse for sale at the Magic Millions as a yearling. Saturday’s win took Chapter And Verse’s prize money to $744,625 a handsome return on his yearling price of $28,000. The gelding set a race record of 1.14.85, shaving 0.15 secs off the previous mark set by multiple Group One winner Buffering.